"Wouldn't it be cool to spend a year with Greg Oden?" Read more about "Wouldn't it be cool to spend a year with Greg Oden?" Last night I had the opportunity to visit the Vancouver Museum (or, Museum of Vancouver) to attend a lecture featuring three presentations about bicycle parking. Titled "Park This! Inspirational and Effective Solutions for Bike Parking" short presentations first showed implementations worldwide, then the second more generally addressed bike parking as a public issue, and the third discussed Vancouver's experience specifically. 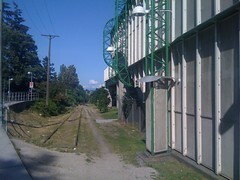 The Vancouver Public Space Network (VPSN) took photos of the event and the subsequent Velo-City museum tour. As I sarcastically predicted, bike parking was inadequate for the event (1, 2, 3, 4, 5, 6). Addison Berry, aka @add1sun, presented about her experience as documentation lead for the Drupal content management system project the other day at the Writing Open Source conference in Owen Sound. In her role as chief cat-herder, she found that the most difficult people aren't poisonous.